Do you wish to return or donate seed to Chico Seed Lending Library? GREAT! You’ve come to right place to learn how. We have some basic Seed Protocol and Guidelines to help you in returning or donating seed. Dry: Make sure seeds are completely dry. Clean: Have seeds reasonably cleaned by removing as much of the chaff as possible. Properly saved: Only return seeds from plants that you know how to save properly. “Beginner” seeds can be fairly reliably saved without cross-pollination (and unintentional hybridization). “Beginner” seeds include tomatoes, beans, peas and lettuce. Do not return seeds from the brassica (ex. broccoli, cauliflower, kale, brussel sprouts, cabbage) or cucurbit (ex. cucumbers, squash, melons) families unless you have taken appropriate steps to prevent cross-pollination, such as hand-pollinating. Label! Label! Label! 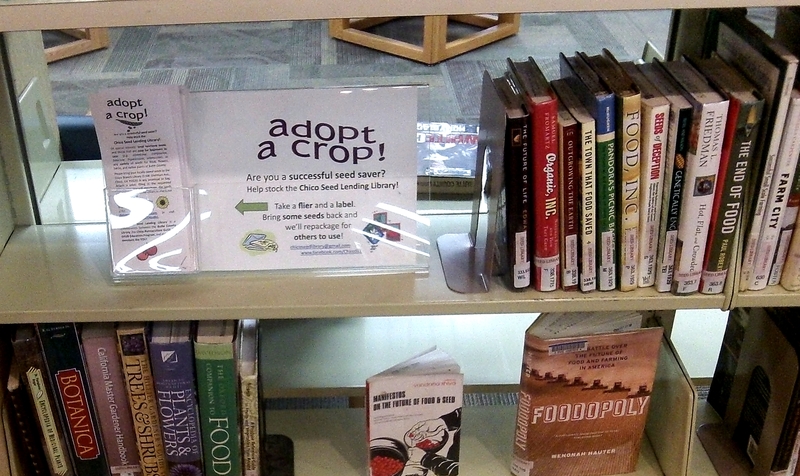 We have seed donation forms located on the counter next to the seed library drawers and binders. Please fill out one donation form for each variety of seed you wish to return/donate. Write as much information on the form as possible. Remember that people only have what you have written on the form to decide if it is a plant that they would like to grow. More information is always better. We have monthly ‘Lettuce Get Together’ work parties where we separate out seed returns/donations into individual packages and label them with your information. Drop off seed: Please bring your seed in a well sealed container with your donation form to the Chico Branch Library located at 1108 Sherman Ave. in Chico. You can then leave the seed with library staff. Save from healthy plants. Even if a disease does not get passed on through the seed, we do like to have some selection for disease resistance by only saving from healthy, strong plants. Save from a number of plants so that the seed has some genetic diversity in it. The quantity that is optimum depends on the type of plant, for self pollinating plants a minimum of 6 plants is necessary, for cross pollinating you want to save from much a larger population- see seed saving information sheets. If the plant cross pollinates you want to make sure you keep it isolated so it stays “true to type.” Check with a seed saving chart or book to get isolation distances. On occasions, we may save seed from a favorite plant that might not be from a large population of plants or isn’t super healthy, or maybe we like some interesting crosses that happened. You are welcome to bring those seeds in, just make sure you clearly write on the label those relevant facts so others know they are participating in your experiment. If you are an experienced seed saver we need your help! You can ‘Adopt A Crop‘ with CSLL and grow out unique varieties of seed for donation to our growing seed library!